The Drake Court Apartment complex, a set of 14 buildings, is listed on the National Register of Historic Places. The Drake Court buildings were built from 1916 to 1918. In their original condition, they were found on the edge of the city of Omaha, in an affluent and desirable residential area of town. The surrounding area contained many mansions and upscale housing units, of which Drake Court was a part. The Drake Court complex was home to many professionals and downtown employees, and was not only an attractive place to live, but had the proximity to downtown and the amenity of adjacent streetcar lines to add to their appeal. This was very convenient for residents going to work downtown, as well as to entertainment and shopping. The apartments were offered as furnished efficiency units, complete with deep cherry wood trim. The owner and developer, Mr. William Drake, even made his marble-floored home in one top-floor unit of Building 13. The buildings designated in this district were financed and constructed by William Drake and his Drake Realty Construction Company, which was also responsible for constructing many other complexes within the city. Drake had always dreamed of becoming the “biggest apartment house king of the world,” and by 1922, his company was building apartments at the rate of one floor a week. By 1925, he was estimated to be worth as much as four million dollars, but his over-exuberance cost him his fortune as he began out-build his own apartments, and went bankrupt before he was 33 years old. In 1998, at the request of the Nebraska Investment Finance Authority, the Joslyn Castle Institute for Sustainable Communities became involved in the revitalization of this distressed portion of downtown Omaha. 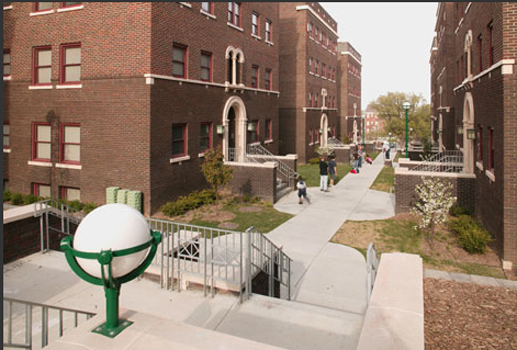 JISC developed the pre-development studies of the area and led a process centered upon, and utilizing, the renovation of the historic Drake Court Apartments (14 buildings) and a newly created downtown neighborhood school, as a catalyst for urban revitalization. The objective was to develop a strong inner city neighborhood that includes low-income and market-rate residential units with mixed-use commercial development. This initiative provided a physical illustration of a neighborhood that depicts the potential of urban redevelopment based upon the concepts of sustainability. The project wass intended as an example for local decision leaders, such as public officials, developers, investors and residents. Conducted in affiliation with several interested parties this effort was intended to change a part of our downtown by creating a neighborhood with distinct character and a lively, healthy, pedestrian environment in which to live, work, and play. The Joslyn Institute Final Report to the Drake Partnership, Drake Court: Revitalizing an Omaha Landmark for an Urban Neighborhood’s Sustainable Future documents changes in the area under the influence of a nine-year committment by The Nebraska Investment Finance Authority, the City of Omaha, NuStyle Development, Joslyn Castle Institute for Sustainable Communities among others joined in reviving this inner city landmark. The redevelopment of the four-block Drake Court housing project in Omaha is the result of a comprehensive study by the Joslyn Castle Institute for Sustainable Communities that sparked the revitalization of this inner city neighborhood and now serves as an example of how sustainable practices can transform the inner city. Joslyn Institute played an active role in the project as a consulting partner, working with the developer, the Nebraska Investment Finance Authority, and the City of Omaha in a four-year commitment to transform the neighborhood—through sustainable practices—into a vibrant downtown community. Built in the1920s on the western edge of downtown Omaha, over the years the fourteen remaining buildings of the Drake Court housing project became blighted and mostly uninhabited. In 1998, JCI planners saw an opportunity to revive the four-block complex to meet the growing consumer demand for residential development near the downtown area. Planners also noted positive signs of urban revitalization in the vicinity, including the restored Rose Theater, the Omaha Children’s Museum, the Flatiron Cafe and Flatiron Building, and the Magnolia Hotel. The streets, district, and neighborhood surrounding the Drake Court housing units offer an exceptional opportunity for sustainable development through the blending of mixed uses, mixed income, and revitalized commercial and housing accommodations. JISC’s pre-development process included public forums designed to gather ideas, images and concepts; demographic and economic research; and the joining together of prospective public and private partners. Drake Court is a catalyst for other inner city development projects, and will serve as an example for other cities that need to provide more residential choices to urban dwellers. In today’s economy, the primary motivation for choosing to reside in an urban community is no longer predicated upon job availability alone, but also includes concerns for quality of life, attractiveness of the built and natural environment, and the perception of vitality, safety and affordability. In this respect, Drake Court will not only provide a sustainable alternative to urban dwellers, but also a living lesson for the future of inner city planning and redevelopment.